_Cornell has been selected to lead a national, five-year, $10 million Environmental Protection Agency environmental education professional development program. Traditionally, environmental educators have focused on pristine, natural environments while teaching in schools, nature centers and outdoor education centers. More recently, a new tradition is emerging in cities, with community development, environmental restoration and social justice groups also teaching environmental education, largely to minority and urban youth. Cornell's "EECapacity" project seeks to link these two types of educators through workshops, online courses and other means, and to create opportunities to exchange ideas, practices and resources. Through a series of workshops and innovative outreach strategies, EECapacity will bring educators together from traditional and nontraditional urban backgrounds to exchange ideas and resources, form social networks. Additionally, there will be a research component to test the notion that diverse groups of educators, given opportunities to share practices and ideas, will develop innovative environmental education practices. Among more than 30 collaborators, major partners include the North American Association for Environmental Education and its State Affiliate Network; Environmental Education Exchange; Akiima Price Consulting; the Association of Zoos and Aquariums; Cornell Laboratory of Ornithology; Green Guerillas Youth Media Tech Collective; Institute for Learning Innovation; the National Oceanic and Atmospheric Administration; the U.S. Fish and Wildlife Service; and the U.S. Department of Agriculture's People's Garden Initiative. _With over 80% of the US population living in urban areas there is a need for programs that help urban residents become more environmentally literate. Informed perspectives about the health and well being of a community empower residents to make their neighborhoods a safer, cleaner, and healthier place to live. 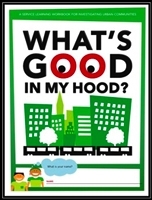 Whats Good in My Hood? is designed to be useful for schools, homes, after school programs, youth groups, and any other groups interested in having a dialogue about their community and making their community a better place.